The suspected terrorist accused of ploughing into cyclists outside the Houses of Parliament in London had recently been kicked out of university, it has emerged. Sudanese immigrant Salih Khater (29), who is currently being questioned by police over the Westminster attack, was forced out of Coventry University after failing the first year of his accountancy course. More details have begun to emerge about the suspect, who lived in a small flat in Birmingham and described himself as a shop manager who loved Western pop music and football. 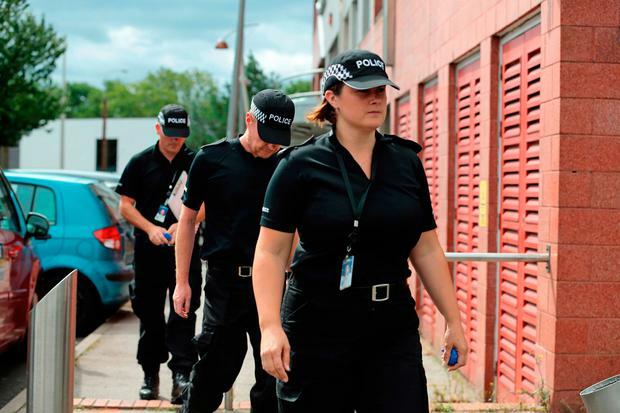 Addresses in the Midlands were being searched yesterday as police investigated Khater, who was arrested on suspicion of preparing an act of terror. Police revealed yesterday that he was later further arrested on suspicion of attempted murder. Khater is believed to have travelled through the night to stake out Westminster for more than an hour-and-a-half before mowing down cyclists in the heart of Westminster on Tuesday morning. He waited until rush hour before swerving on to the wrong side of the road and hitting cyclists who were waiting at the traffic lights. He then crashed into barriers outside the entrance to the House of Lords. Khater was previously an accountancy student at Coventry University – but was kicked out when he failed the first year of his course. “Salih Khater studied accountancy at Coventry University between September 2017 and May 2018,” said a spokesman. “As of May 2018 he is no longer enrolled at the university. He had previously studied electrical engineering at Sudan University of Science and Technology in Khartoum. Before that he went to school in Wad Madani, a town in east central Sudan, where his parents were sorghum farmers. According to friends, Khater had moved to the UK about five years ago, and became a citizen. His social media profile showed he liked pop stars Celine Dion and Rihanna, and the rapper Eminem, along with Sudanese music. Posts about music, in English and Arabic, were interspersed with others of mosques and desert landscapes. He had more than 300 friends on Facebook. In 2010, he posted a series of music videos including Celine Dion performing ‘Because You Loved Me’ in Memphis. He posted another video of Eminem and Rihanna’s ‘Love The Way You Lie’. Khater also supported Al-Merrikh SC, a football club based in Omdurman, Sudan. By 2011 friends on social media began wondering where he was and asking if he was OK, after he went silent. After that he posted only a few desert pictures, the last on July 17 this year. About four months ago he moved out of a flat over an internet cafe where he had been staying alone in the Sparkbrook area of Birmingham. Police have been to the Bunna Internet Cafe and taken away a computer, and other items in plastic bags. Khater moved to another flat in Hall Green, Birmingham, but was reportedly seen regularly at the internet cafe, including on the day before the attack. According to people there he rarely conversed. One said Khater’s father and brother had died within a short space of time. His former landlord said he always paid his rent on time. Next articleBrendan Keenan: Can Ireland have national health without an NHS?